South Point Hotel-Casino and Spa is located on the South end of Las Vegas Boulevard and is adjacent to Interstate 15. The hotel-casino has Mediterranean style decor with a splash of influences from the California Coast. 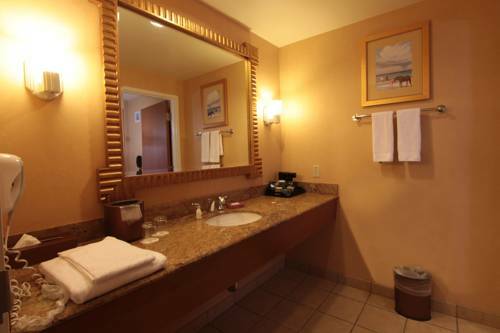 Its guest rooms are oversized with an LED flat screen TV and high speed and wireless internet access. There is also a world class spa and a state of the art fitness center with all the latest in elliptical equipment. South Point has in addition to its multitude of amenities- an impressive Equestrian and Event Center and over 150000 square feet of Convention and Exhibit space. The property also has a beautifully landscaped pool and Jacuzzi. Michaels Gourmet Room: Award winning continental cuisine. Silverado Steak House: Elegant dining. Garden Buffet: Serving breakfast-lunch-dinner and brunch on Sundays. Primarily Prime Rib: Elegant surroundings with a menu that includes prime rib-chicken-seafood and more.